A firm lunch or dinner favourite, either as a plated offer or as a grab and go. The added benefit being the use of a gluten free milk bun. The burger can be finished with any salad garnish you prefer. The meats can be changed to create either chicken or lamb alternatives. In the bowl of a stand mixer, combine the flours, xanthan gum, salt, sugar and yeast, mix well. Add most of the warm water, plus the vinegar and oil. Beat on low to start and then increase the speed for about 3 min. to form a soft, smooth and sticky dough. Scrape the mixture down from the sides a couple of times during the mix. Add a little more more water if the dough seems a little dry: it should be softer and wetter than normal dough. Do not flour the surfaces with flour, instead use oil. Divide the dough into 10 oiled muffin tins (aiming for the size you wish the burger to be) filling the muffin tin until two thirds full. Coat the top of each of the buns with oil and dust with gluten free flour. Preheat the oven to 190°C. bake for about 20 min., until golden on top and hollow if tapped. Remove and cool slightly before removing from the muffin trays onto a cooling rack. Mince the rump and chuck steak on a coarse setting. Mix the minced steaks with the salt and pepper and form into 10 even sized patties. Grill the burger until the meat is throughly cooked, meanwhile cut and toast the buns. Spread a portion of HELLMANN'S Light Mayonnaise onto the bottom layer of the bun and then the lettuce. 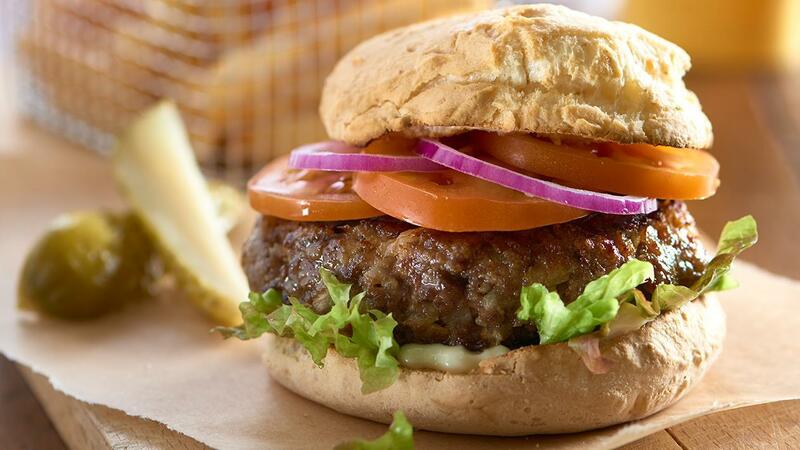 Place the cooked burger on top of the lettuce then add the sliced tomato, red onion and top with the top of the bun.